Use of url-shortening services has been around for quite a while now, and you might not even be aware of it but you might already be using such a service! If you use Twitter, for example, to notify your followers that you have new content on your blog, you will notice that immediately after a snippet of your blog post is a url which does not look familiar at all but when clicked, it redirects to the correct blog and blog post you have published! While there are many such services that now flourish in the web, their system uses the same basic principle: paste your long url into a field, click a button, and you get its miniaturized version! The most popular is tinyURL. In fact the name is used as the de facto term! 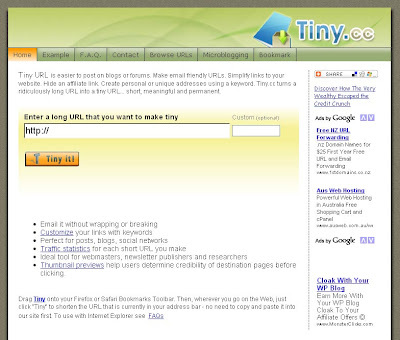 Here's another site where you can get your tinyURL fix: Tiny.cc. Both services are free, and both can integrate into your browser (IE or Firefox) for an even more convenient URL compression of the site you are currently viewing. Also, both sites allow you to customize your tinyURL! Simply select a word to append to their domain name and if it's available, it's yours! TinyURL's also have very long lifespans (practically immortal for TinyURL, and at least one click a year for Tiny.cc will keep it alive). Wish I could have jumped on and grabbed my custom tinyURL when I had the chance but it's too late for me. Why don't you try getting yours?